The Symphony Collection brings elegant form to technology. 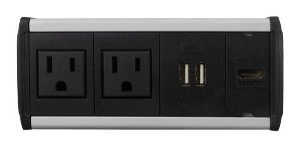 This collection of table boxes features AC outlets, USB charging ports and low voltage openings. The Symphony Collection is available in: Clamp-On, Under-Table, In-Table options and 12 different color combinations. The system provides an attractive user interface while solid construction throughout ensures reliable performance in demanding environments. 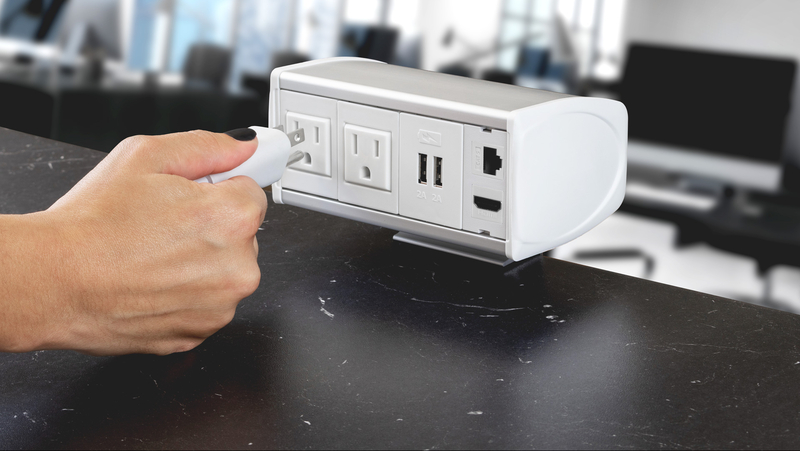 The gentle curved shapes allow for CAT6, 6a, or 7 along with AV cables to bulkhead AV connections while maintaining aesthetics in modern interiors. Located below your work surface, the Symphony under-table model is out of sight but not out of mind when connectivity is needed. The Symphony in-table model provides an attractive user interface combined with a rim and cover. With its sleek, seamless aluminum frame, the design is both modern and elegant. Non-marring C-Clamp table attachment with swivel screw tightener. *Available for clamp-on models only. On "Assemble to order" units, a very flexible ordering system allows for choice of housing extrusion color, end cap color, and connector insert color. 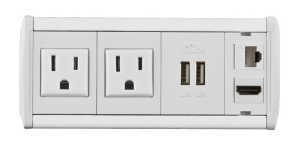 Low voltage openings can receive FSR Simple Solutions and Hubbell&tm; keystone style snap in connectors.